Because of production problems, the CPC 9.25HD TEMPest are currently unavailable. Select the appropriate OTA Type below. Vent Fan Color - Please select from the available colors on the drop down. Please choose make a second DIFFERENT COLOR CHOICE that can be used if your first choice is out of stock. The TEMP-estTM systems are an active venting system that replaces the passive vents in the rear cell of the OTA for quick initial cool-downs and stabilization of temperatures with ambient during the viewing/imaging session. The vent fan system is designed to be run while using the telescope and employs one filtered fan to pull air out of the OTA and another filtered fan to push air into the OTA (for the CPC systems with three vents, two vents push in and one out). The filtered fans use a 55 micron stainless steel filter to keep dust input to a minimum. The vent fan systems run off of standard 12VDC with a 2.1mm center positive plug and the vent fans are wired together so that only one power supply/cable is needed to run both vents. The fans on both sides of the OTA have power sockets for convenience. The fans being used are high quality magnetic levitation fans that offer the highest flow while minimizing vibration. The purpose of the vent fan system is to help the primary mirror and interior air remain as close to ambient temperature as possible in order to minimize the formation of tube currents in the OTA and to do this while using the scope for viewing and imaging. Each vent assembly is custom CNC-machined for the OTAs and made from materials like solid surface acrylic polymer and recycled materials are used when available. The vents can be made in a variety of colors depending on available supplies. Power cables can be ordered along with the fans for connection to your 12VDC power supply or powered USB. The vent fans only require a single cable since they are connected together inside the back of the scope. The cables are 6 feet long and have the 2.1mm plug on one end and are bare on the other end so that you can add whatever type of power connection you like (e.g., cigarette lighter, power poles, RCA connectors, alligator clips, etc.) or can be ordered with a cigarette lighter plug or a USB 5 volt to 12 volt adapter on one end. TEMP-estTM installation instructions can be found here: Installation Instructions. 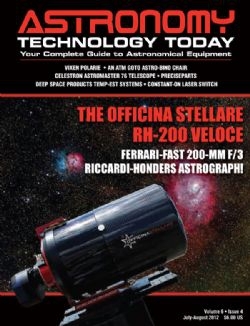 Read the report on the TEMP-estTM Systems in the July-August 2012 issue of Astronomy Technology Today by clicking on the cover below.